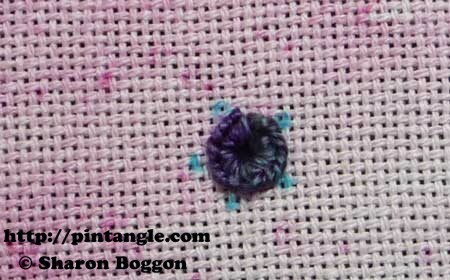 I found Buttonhole Eyelet Flower in A-Z of Embroidery Stitches 2 . It is called Buttonhole Eyelet flower and has a base created by first working a buttonhole wheel, then you add bullion knots around the wheel. Although at first glance it looks quite restrictive you can do quite a bit with it. Buttonhole wheels can also be worked in halves and quarters in various arrangements. So half and quarter flowers can be worked. You can work the wheel as an oval disk or even heart shapes! 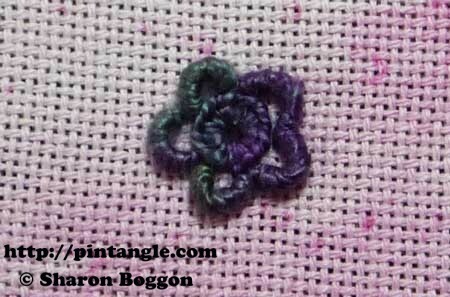 It is also easy to add more rings of ‘petals’ in bullion knots. This is what the finished stitch looks like. 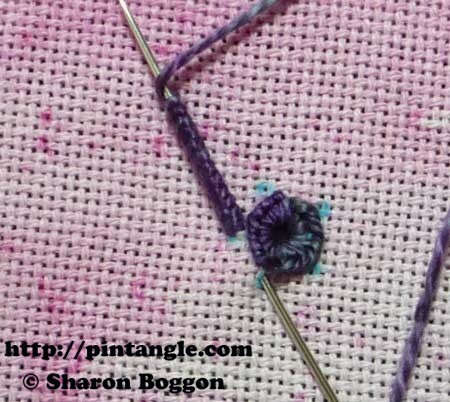 How to work a Buttonhole Eyelet flower. 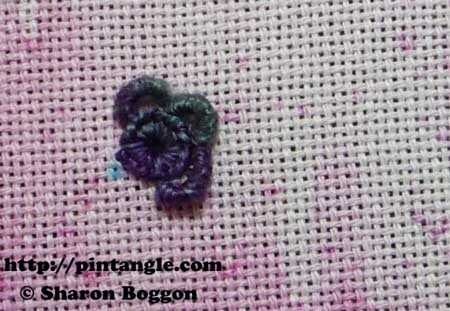 This sample was worked in perle 5 thread and I assume you know how to work a buttonhole wheel, and bullion knots. If you need a refresher follow the link to tutorials. Mark a small disk shape on your fabric using a dissolvable marker pen. Work a buttonhole wheel, making sure that you pass each vertical stitch through the same point in the centre. 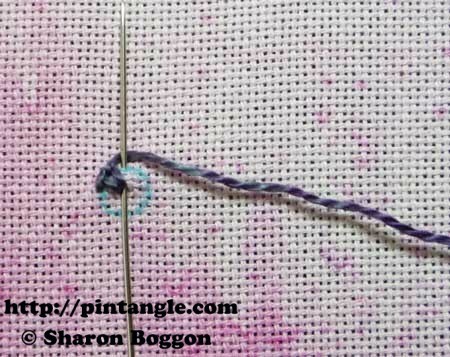 Bring the thread out on the edge of the circle, insert the needle into the middle of the wheel and loop the thread under the needle point. 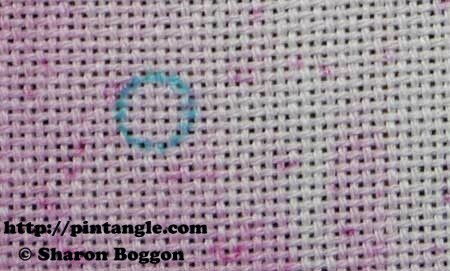 Pull the needle through the fabric to form a loop and repeat this process around the circle. If the edge of your wheel edge flips up it is probably because you are not spacing the stitches close enough together. Using a dissolvable marker pen place 5 tiny spots around the edge of the wheel as illustrated. The next step is to work bullion knots around the edge of the wheel. Bring your thread out at the first spot. 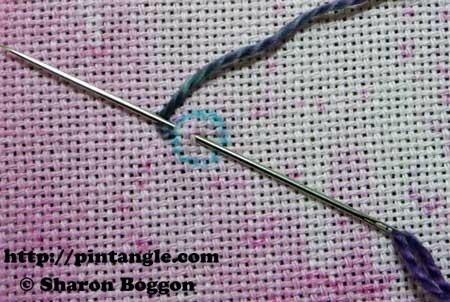 Working in an anti clockwise direction insert your needle in the second spot and make a bullion knot. 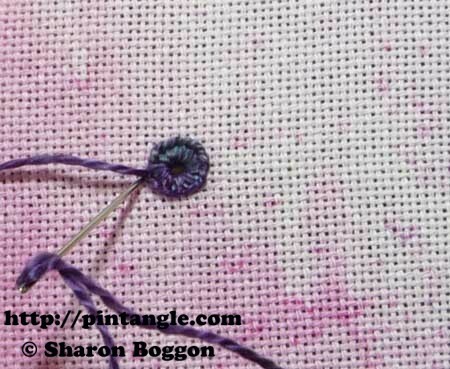 The bullion knots in the sample are 15 wraps of the needle using a perle #5 thread. Wrap the thread round the needle 10-15 times and then pull the needle carefully through the coil.The more wraps the larger the loop that is formed. While pulling the needle through the coil, put your left thumb over the coil to hold the coil down. Pull the working thread through the coil until it starts to tighten and then stroke the under belly of the coil with your needle. This will smooth the coil and neaten the stitch. Take the needle through the fabric at the point where it came out. Work your way around the wheel until the flower motif is done. By changing the number of wraps of the bullion stitches you can make the petals more or less loopy. 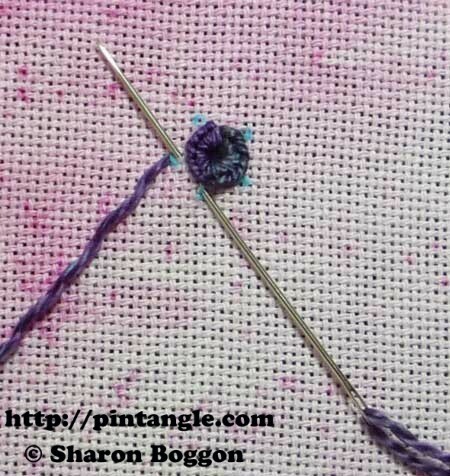 Here are my samples of buttonhole eyelet flower stitch. I triedout this stitch and it is here at photostream. My flowers – not a very good photo – sorry. But to show you that I am working, hahaha. Am I the last in the class to post? Sorry, it’s been a hectic week. I’ve stitched my sample on the tiny canvas of fabric covered buttons this week. It is summer here where I live and I enjoyed to stitch flowers. Thank you, Sharon, for introducing this great stitch. I’m wondering if the new year will bring me more time to read and stitch. That’s all I really want to do, but I have tons of other “finish my house” things to get done, first. And holiday stuff, too, now. Someday… Thanks, Sharon, for this challenge. It makes sure I get at least a teeny, tiny bit of stitching done each week. Hi Sharon & Friends. My post fo the week. Thank you all. Here is my arrowhead sample. I’m impatient to complete my stitches’ book. Stitches like this make me feel exceptionally clumsy like I need at least one more hand and it has to be a lot smaller and more nimble than the ones I have. Just not cut out for freehand embroidery, I fear. I have been following these challenges for a while (visually) and would like to commit to them in 2013, either doing the ones from 2012 or joining in a 2013 challenge. I have done extensive crosstitch on aida cloth, but little else. I am eager to learn, but would like to know 1) what is the best inexpensive cloth to practice on? 2) what size needles work best? Thank you. I suggest you use scrap aida and linen, and even old table cloth and tea towel linen. Buy a pack of mixed sized embroidery needles. I say this because it’s more important to put your money towards different threads try cotton perle # 8 and cotton perle 5. Put some money there and get away from the stranded cottons as they will wring the life out of surface embroidery and make your learning and exploration boring for you. Thank you so much, Sharon. And thank you for all the work you put into this site and the challenges. I have always wanted to learn embroidery but do not know anyone who does it. When I ran across this site I finally felt embroidery was something I could learn! Roxane, Go ahead and join in next year – you’ll love it!! Here is my small sample for this week.